A considerable body of research indicates that mammary gland branching morphogenesis is dependent, in part, on the extracellular matrix (ECM), ECM-receptors, such as integrins and other ECM receptors, and ECM-degrading enzymes, including matrix metalloproteinases (MMPs) and their inhibitors, tissue inhibitors of metalloproteinases (TIMPs). There is some evidence that these ECM cues affect one or more of the following processes: cell survival, polarity, proliferation, differentiation, adhesion, and migration. Both three-dimensional culture models and genetic manipulations of the mouse mammary gland have been used to study the signaling pathways that affect these processes. However, the precise mechanisms of ECM-directed mammary morphogenesis are not well understood. Mammary morphogenesis involves epithelial 'invasion' of adipose tissue, a process akin to invasion by breast cancer cells, although the former is a highly regulated developmental process. How these morphogenic pathways are integrated in the normal gland and how they become dysregulated and subverted in the progression of breast cancer also remain largely unanswered questions. Relatively simple in its form and function, the mammary gland nevertheless requires a complex interplay of both intracellular and extracellular signals for its development into a branched glandular structure. The extracellular matrix (ECM) has long been recognized as providing morphogenic signals during mammary gland branching morphogenesis . However, systematic studies to define the precise mechanism(s) by which the ECM accomplishes its role are lacking. The unanswered questions include: do interstitial ECM and basement membrane (BM) act as single entities or do their individual components have distinct effects? What ECM receptors are used to transmit these signals, and how do ECM remodeling proteinases fit into these morphogenic events? In this review, we briefly summarize a vast amount of research that touches on these areas. We mention several existing hypotheses, put forth a few more, and suggest some possible future directions for the field. A branched epithelial structure includes a network of tubes that are integral to the function of a number of glandular organs [2, 3]. Lung , kidney , salivary gland [6, 7], and mammary gland [8, 9] are examples of organs that develop through branching morphogenesis. The latter is unique among these organs in that the majority of its branching is postembryonic. Extensive branching begins in puberty in the female and ceases after expanding to the outer limits of the mesenchymal fat pad. A number of paracrine, juxtacrine, and autocrine factors are known to affect mammary gland branching morphogenesis . We have summarized these factors in Table 1; however, a detailed discussion of these factors is beyond the scope of this review. Here, we focus primarily on the studies that involve ECM, integrin and nonintegrin ECM receptors, ECM-degrading proteinases, and proteinase inhibitors in regulation of mouse mammary gland branching morphogenesis. * ↑, augmentation of branching; ↓, inhibition of branching. MMP, matrix metalloproteinase; TGF, transforming growth factor; TIMP, tissue inhibitor of metalloproteinase. Branched structures are first seen in the mouse mammary gland in late embryonic development . Expansion of the ductal tree within the fat pad occurs rapidly after 3 to 4 weeks of age, when ovarian hormones begin systemic circulation, and ceases around 10 weeks of age . During branching morphogenesis, primary ducts elongate, driven by terminal end bud proliferation, and the tree 'fans out' within the fat pad through a process of terminal end bud bifurcation and lateral side branching. Given the complexity of mammary gland morphogenesis, we recommend that models used to study this process consider the following three criteria: the length of the duct [ductal extension], the bifurcation of leading or primary ducts [or a measure of the number of primary ducts], and the number of side branches formed independently of bifurcation [lateral branching from existing ducts]. These distinctions are necessary, because there is some evidence to indicate that each of these processes is differentially regulated by ECM molecules, ECM receptors, the ECM degrading/ inhibiting enzymes, and soluble branching morphogens. After 10 weeks of age, alveolar differentiation/regression is the predominant morphological event, under the influence of the estrous cycle [13–15]. During pregnancy, more lateral branching occurs to provide a connection between milk-producing alveoli and primary collecting ducts . In most aspects, human breast development resembles mouse mammary gland development , although there are some notable differences . Mammary ducts consist of an epithelial layer intimately associated with a single layer of myoepithelial cells at their basal end. A sheath of BM encircles the duct, which in turn is surrounded by an outer ring of fibrous interstitial ECM surrounded by a loose connective tissue. Within the ductal unit, myoepithelial cells are more intimately connected to BM than are epithelial cells, a spatial arrangement that changes during different stages of mammary development and cancer [19, 20]. During morphogenesis of the gland, differences in the composition, size, and most probably function of the BM can be found when comparing terminal end buds to subtending ducts. For instance, the BM of terminal end buds displays differences in thickness, being thinner (104 nm) at the tip and becoming extensively thicker (1.4 μm) along the flank of the terminal end bud. Moreover, the BM at the tip of the terminal end bud is rich in hyaluronic acid, which may mediate morphogenesis . The BM of the ducts, in contrast, is a meshwork of collagen type IV, laminin 1, laminin 5, and heparan sulfate proteoglycans; other constituents such as entactin/nidogen, vitronectin, and fibronectin are also present . Early studies involving development of the mammary gland in vivo showed that inhibition or augmentation of either collagens or glycosaminoglycan deposition attenuates branching [1, 21, 23]. These experiments indicated that regulation of mammary gland branching morphogenesis in vivo is dependent not only on the maintenance of specific types of ECM but also on total amounts of ECM. Therefore, the regulation of branching may be dictated by the composition of the ECM components present, the quantity of the components, and where they are situated within the developing tree. For instance, growth-promoting, nonadhesive, and promigratory ECM components may be more prominent at the front of terminal end buds, whereas ECM with the opposite characteristics could be found around stationary ducts (Fig. 1). However, this hypothesis may be too simplistic, because several ECM components exhibit both promoting and inhibitory characteristics, depending on the model used or the cell line examined , and, as we discuss later, ECM receptors and ECM-degrading proteinases need to be integrated into any mechanism of ECM-directed morphogenesis. Proposed spatial organization of the extracellular matrix (ECM) and integrin function during mammary gland branching morphogenesis. The composition of the ECM that surrounds developing ducts and the type of integrin that relays signals from the ECM would depend on the morphogenic event. Areas requiring invasion and proliferation and low adhesion (TEBs [terminal end buds], side branching) would have a unique ECM/integrin profile compared with areas that are dormant (primary ducts, noninvasive end buds). Unique signals in areas that may require stem or progenitor cell differentiation may require specific ECM-integrin profiles, unlike other areas. Direct attachment of epithelial cells to ECM occurs through basally located integrins [24, 25] (Table 2) and nonintegrin ECM receptors [26–29] (Table 3). Gene knockout studies in mice where particular integrin subunit has been deleted indicate that integrin heterodimers containing α3, α6, or β4 integrin subunits are not required for mammary branching morphogenesis , while α2 integrin knockouts exhibit diminished branching . In cultures of human mammary epithelial cells, blocking antibodies against α3 integrin enhance branching when cells are cultured within collagen type I , while the same antibody inhibits branching when cells are cultured on top of laminin rich basement membrane gel (lrBM), Matrigel (BD Biosciences, Bedford, MA) . These two studies indicate that one integrin may relay opposing morphogenic signals depending on which ECM ligand is present, and that branching assays in culture may not coincide with in vivo findings. The α6β4 integrin, which is expressed in myoepithelium in vivo and in most immortalized breast cell lines, is another integrin that is necessary for branching in culture  but not in vivo . Several studies have examined the function of β1 integrin during mammary gland branching morphogenesis. In vivo, developing mammary glands confronting blocking antibodies against the γ1 chain of laminin (a subunit of all laminins except laminin 5 and a major ligad of β1 integrin subunit) or function-perturbing β1 integrin antibodies show terminal end bud regression, fewer terminal end buds, and decreased ductal elongation, while blocking antibodies against the α6 integrin subunit had no effect . In contrast, transgenic mice expressing a dominant negative β1 integrin subunit under the control of the MMTV (mouse mammary tumor virus) promoter do not exhibit altered mammary gland branching morphogenesis, but instead showed a reduction in alveolar differentiation and an increase in alveolar apoptosis . In cultures of collagen type I, blocking β1 integrin function inhibits branching, as does blocking α2 integrin function . These conflicting β1 integrin results may stem from differences in the nature of the cell types or ECM that confront the β1 integrin antibody and the extent of its loss or overexpression. In vivo, endogenous β1 integrin is found in several cell types, including the cap cells of terminal end buds, myoepithelial cells, and luminal epithelial cells . To make the picture even more confusing, conditional knockout of β1 integrin, within the mammary gland, appears to have no obvious phenotypic consequences for the development of the mammary gland (William Muller, McGill University, personal communication). Integrin studies have indicated that for normal ductal development to occur, ECM adherence through specific integrin subunits is necessary; however, de-adherence is also required for normal branching, since antibodies against β1 integrin, which 'anchors' cells to ECM, attenuate branching morphogenesis . Factors that determine integrin-binding characteristics are complex and include subunit composition, integrin recognition sequences within the ligands, the nature of the divalent cation present, and the activation state (high anchoring or low) of the integrin . Finally, spatial distribution of integrins within the developing ductal tree must be considered and is an area that has not been fully explored. It is likely that integrins, in a manner analogous to the ECM components, are differentially localized or differentially activated within a developing tree, where promorphogenic integrins are found in areas of migration, invasion, and de-adhesion and integrins with opposite characteristics are found at the base of the branching point or at the cleft of a bifurcating structure (see Fig. 1). Nonintegrin ECM receptors have also been implicated in mammary gland branching morphogenesis. Overexpressing cell-surface β-1,4-glactosyltransferase (GalTase) in mammary epithelium leads to inhibition of mammary gland morphogenesis . This receptor participates in both cell–cell and cell–ECM interactions through recognition of N-acetylglucosamine residues on glycosylated ligands. It is likely that dystroglycan, another nonintegrin cell-surface ECM receptor, plays a key role in mediating morphogenic signals from laminin 1 for acinus formation in the mammary gland ; it may also be involved in branching signals, as is the case in lung, kidney, and salivary glands . Several types of collagen can act as ligands capable of activating the discoidin domain receptor 1 (DDR1) tyrosine kinase . DDR1 is expressed on both epithelium and myoepithelium, and DDR1-deficient mice have excessive mammary collagen deposition, delayed ductal development, enlarged terminal end buds, hyperproliferative ducts, and incomplete lactational differentiation . Galectin, another nonintegrin ECM receptor, may also function during mammary gland branching morphogenesis, since it has been shown to regulate ureteric bud branching in the kidney . Pioneering experiments from the Wessels and Bernfield laboratories showed that increased activity of ECM-degrading proteinases, such as collagenase or hyaluronidase, altered branching morphogenesis in kidney, lung, salivary gland, and pancreas [44, 45]. Subsequent studies found that collagenase reduced bifurcation by inhibiting the deposition of collagen type I fibrils in the developing salivary gland , and that a collagenase inhibitor increased bifurcation, presumably by increased deposition of collagen type 1 fibrils at the cleft. However, ECM-degrading proteinases could affect branching morphogenesis at levels well beyond the physical consequences of remodeling the ECM (Fig. 2). First, signaling through cell-ECM receptors would be lost or modified when ECM is altered through ECM-degrading proteinase activity [47, 48]. Second, neo-epitopes, cryptic in intact ECM molecules, may be exposed after digestion of ECM, to provide new morphogenic signals to surrounding cells [49, 50]. Third, factors capable of influencing morphogenesis, which are intimately sequestered by ECM, may now be released after ECM remodeling [51–54]. Fourth, cell–cell attachment molecules may be lost through proteolytic cleavage, thereby releasing cells for migration [55–57] or mesenchymal transition . Finally, shedding of cell-surface receptors or bound factors by sheddases, which are also capable of digesting ECM, may release morphogens [58, 59]. Mechanism by which matrix metalloproteinases (MMPs) can affect branching morphogenesis. 1. Proteolytic digestion of extracellular matrix (ECM) would alter ECM-integrin tethering and ECM-integrin signalling [47-48]. 2. Cleavage of ECM may produce soluble ECM fragments containing morphogenic activity [49-54]. 3. ECM-sequestered factors may be released to produce morphogenic gradients or signalling [52-54]. 4. Loss of cell–cell adhesion molecules by MMPs would lead to epithelial-to-mesenchymal transition and increased invasiveness [55-57]. 5. Ligand or receptor shedding might initiate autocrine, juxtacrine, or paracrine morphogenic signalling [58-59]. Branching morphogenesis, whether examined in the mammary gland or in cell culture, involves an invasive process. One class of ECM-degrading proteinases is the matrix metalloproteinases (MMPs), many of which are capable of facilitating cellular invasion [60–62]. Their activity has been shown to mediate lung [63–65], kidney [34, 66], and salivary gland  branching. In the mouse mammary gland, MMP mRNA and activity are evident during branching morphogenesis and involution [12, 68–70]; and in transgenic mice, overexpression of active MMP 3, MMP 7 (matrilysin), and MMP 14 (MT1-MMP; membrane type-1-MMP) led to ductal hyperplasia and in the case of MMP 3 and MMP 14 also to tumorigenesis [69–73]. Although limited branching analysis was performed in the MMP 7 and MMP 14 transgenic mice, these studies suggest that MMP 3 overexpression is associated with altered branching morphogenesis, while overexpression of MMP 7 or MMP 14 is not. Determining the differences in substrate specificities between MMPs should allow an understanding of why certain MMPs, when overexpressed, exhibit morphogenic capabilities while others do not. MMP 14 and MMP 2 are key proteinases in branching morphogenesis during epidermal-growth-factor-mediated lung development , and MMP 14, independent of pro-MMP 2 activation, can confer invasion and tubulogenesis of noninvasive MDCK cells in matrices of collagen type I, while MMPs 1, 2, 3, 7, 9, 11, and 13 cannot . Therefore, tissue specificity also appears to determine whether specific MMPs can act as branching morphogens. Induction of MMP 3 in a clonal mouse mammary epithelial cell line, ScP2 , leads to cleavage of E-cadherin, loss of associated β-catenin, and epithelial-to-mesenchymal transition (EMT), and to an invasive phenotype . We have further shown that MMP 3 can induce branching morphogenesis in mammary organoids in three-dimensional cultures of collagen type I . Importantly, MMP 3-induced branching occurs in the absence of added growth factors in these organoid cultures. It is tempting to speculate that MMP 3 activity leads to a transient EMT that may be necessary for the invasion of the mammary gland ductal tree in the fat pad (Fig. 3). The idea is that at the leading edge of ductal migration, epithelial cells may exhibit mesenchymal-like characteristics allowing them to invade as an organized structure, similar to what happens in the development and patterning of several other tissues and organs that exhibit EMT . Proposed morphogenic mechanisms mediated by matrix metalloproteinases (MMPs) and MMP inhibitors. At sites of invasion and migration (TEBs [terminal end buds], lateral side branches, invasive end buds), MMP activity may induce a transient epithelial-to-mesenchymal transition (EMT), thereby allowing the tip to move forward. 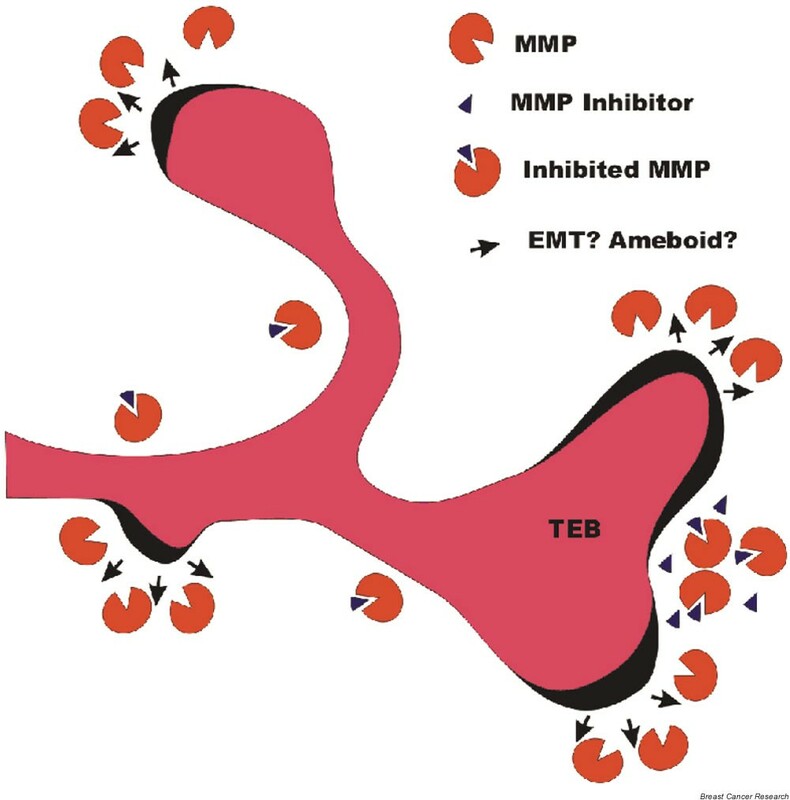 Alternatively, high levels of MMP inhibitors may force an 'ameboid-like' movement, independent of MMP activity, through the meshwork of the extracellular matrix . We have determined that the minimal requirements for branching morphogenesis in clonal populations of mammary epithelial cells are MMP 3 plus epimorphin, a myoepithelial- and stromal-derived mammary morphogen . Indeed, epithelial cells that branch in culture without requiring additional exogenous epimorphin are those that already express epimorphin . Increased expression of epimorphin in mammary glands of transgenic mice leads to enlarged ducts and increased alveoli, underscoring its role in mammary gland morphogenesis . We have found that epimorphin-mediated branching occurs in part through upregulation of MMPs, including MMP 3 . These culture studies, along with the transgenic work cited above, provide a role for MMP 3 and epimorphin as two key morphogenic factors during mammary gland branching morphogenesis. The serine proteinases urokinase plasminogen activator (UPA) and tissue plasminogen activator process plasminogen into plasmin, which, in turn, is capable of degrading ECM and activating MMPs . Plasminogen, but not UPA, has been shown to be necessary for normal mammary development, as plasminogen-deficient mice show a delay in early ductal development and a large percentage of them are unable to lactate because of a lack of secretory epithelium . In contrast, UPA-deficient mice show no detectable mammary phenotype during development or involution . Other evidence suggests that the plasma kallikrein may be the dominant plasminogen activator in the mammary gland . We have shown that MMPs can cooperate with the plasminogen/plasmin system during mammary epithelial branching morphogenesis in a three-dimensional matrix of collagen type I. These studies indicate that while UPA does not induce branching, plasmin can, but in an MMP-dependent manner . In ongoing studies, a number of MMP-null mice are being examined during mammary gland branching morphogenesis to distinguish those MMPs mediating branching elongation versus those mediating lateral branching. These results suggest that certain MMPs, such as MMP 2, promote ductal elongation, whereas MMP 3 induces lateral side branching (Wiseman et al., JCB in press). Determining the precise function of each ECM-degrading proteinase in branching morphogenesis is a time-consuming task, given their localization, activation, and interplay as well as their ever-increasing numbers. However, that proteinases do play a role in mammary branching is clear. There is more than one possible mechanism by which MMPs can regulate mammary gland branching morphogenesis (see Fig. 2); it will therefore be an interesting challenge to tease out which molecular pathway or pathways are involved for which proteinase during this developmental process. Focused research on the spatial distribution of substrates within the mammary gland and localization of MMP activities are likely to provide informative answers. If ECM-degrading enzymes are involved in branching morphogenesis, one would then predict that their biological inhibitors should antagonize the process. While this is generally the case, the results are not always as predicted. For instance, upregulation of tissue inhibitor of metalloproteinase (TIMP)-1 increases bifurcation in the salivary gland  and induces higher numbers of branches in lung development , while in the mammary gland, upregulation of TIMP-1 leads to inhibition of ductal elongation without affecting bifurcation or higher-order branching . In kidney development, TIMP-2 downregulation through antisense oligonucleotides increases ureteric branching morphogenesis , and, similarly, transgenic antisense expression of TIMP-1 leads to supernumerary branches associated with increased ductal elongation and increased mammary epithelial proliferation . Therefore, the function of TIMPs, similar to that of MMPs, needs to be put in the context of tissue-specific microenvironments during branching morphogenesis . It is likely that the processes of bifurcation and ductal extension, both characteristics of branching morphogenesis, are differentially regulated by TIMPs. That is, TIMP upregulation may increase bifurcation through increased focal deposition of ECM molecules, while concomitantly it may hinder ductal extension through limiting degradation of physically constraining ECM. Downmodulation of TIMP-1 by transgenic antisense expression in the mammary gland leads to increased branching and is associated with a loss of laminin in the ductal BM but not collagen type IV, suggesting that laminin degradation may provide a morphogenic signal . Cleavage of laminin 5 by MMP 2 (gelatinase A) and MMP 14 produces a laminin fragment capable of inducing mammary epithelial invasion [50, 87]. However, whereas antisense downregulation of TIMP-1 augments branching morphogenesis, an analysis of TIMP-1-null mice indicates that mammary gland branching morphogenesis is not overtly affected (Fata and Khokha, unpublished findings, and Wiseman et al., JCB in press). It remains to be seen if compensatory upregulation of other TIMPs are occurring in these animals. Given the multiplicity of MMP substrates, TIMPs should be viewed as molecules that mediate both ECM-dependent and ECM-independent events. TIMP-1 and TIMP-2 have been shown to stimulate growth of cells in culture, including breast cancer cells [88, 89]. TIMP-2 mediates activation of MMP 2 on the cell surface through formation of a ternary complex with MMP 14 . One could speculate that expression of TIMP-2 leads to an increase in the activation of MMP 2 on the cell surface by MMP 14, thereby localizing proteinase activity to the immediate extracellular space to augment branching. In MDCK cells, MMP 14 plays a pivotal role in invasion and branching morphogenesis in collagen-type-I matrix . TIMP-3 has a unique ability to inhibit several cell-surface sheddases called ADAMs (a disintegrin and a metalloproteinase), including tumornecrosis-factor-α-converting enzyme (TACE; ), and so far is the only TIMP that becomes tightly bound to ECM after secretion . TIMP-3-deficient mice show accelerated mammary involution and increased rates of adipogenesis . The latter phenotype could be expected from evidence that indicates ADAMs contribute to adipogenesis . Intriguingly, TACE-deficient mammary glands have a severe growth and branching phenotype (M Sternlicht, S Wohler Sunnarborg, DC Lee and Z Werb, unpublished observation). It is possible that TIMPs could force mammary epithelial cells into an MMP-independent migration under some conditions (see Fig. 3). Recent results indicate that inhibition of metalloproteinases does not impede MDA-MB-231 mammary carcinoma cell migration through a collagen matrix, and the cells continue to move using an ameboid migration . Whether or not this is a compensatory mechanism or whether these cells do not use MMPs at all remains to be determined. During expansion of the ductal tree into the fat pad, there is continuous turnover of both BM and stromal ECM [12, 21, 97]. We now know that this degradation is not only to remove an impediment to migration, but that it is also a process in which morphoregulatory signals are generated and/or quenched through remodeling. Remodeling and/or dissolution of impeding ECM would facilitate forward progression of a ductal branch and lessen adhesion of cells to their substrata. Improper remodeling of ECM in the mammary gland can lead to altered branching, as seen with hyaluronidase treatment , cis-hydroxyproline treatment , and changes in the proteinase/proteinase inhibitor balance [12, 69, 70]. Understanding how ECM imparts morphoregulatory signals to breast epithelium is of importance also in carcinogenesis. Breast carcinoma most often is associated with an extensive 'stromal reaction' termed desmoplasia, in which excess collagen is deposited. In fact, changes in the integrity, deposition, and/or composition of the ECM are often associated with breast cancer [22, 98]. Moreover, upregulation of expression of the fibrillar collagen gene is a robust indicator of metastatic phenotype [99–101]. ECM and factors that attenuate or augment signaling regulate branching morphogenesis in a process that may be thought of as controlled invasion. Where ECM accumulates aberrantly, as is the case for collagen type I in desmoplasia and fibrosis, other processes also begin to go wrong. For example, increased collagen type I has been shown to upregulate activated MMP 2 in human metastatic breast cancer cells . This in turn could increase production of the morphogenic fragment of laminin 5, enhancing an already promigratory environment. Other collagens such as types III, V, and VII are also altered in expression and deposition in breast cancer [64, 103–105], undoubtedly imparting signals that lead to loss of structure and function in the breast. Laminin 1 has been shown to be produced by myoepithelial cells in the breast  and is downregulated in breast carcinoma together with the hemidesmosome integrin subunit α6 . Downregulation of laminin 1 and α6 integrin is most likely due to the absence of the normal myoepithelial cells or the presence of aberrant breast cancer myoepithelial cells . Other ECM proteins such as fibronectin, tenascin, thrombospondin, and glycosaminoglycans also change in breast cancer . Other hallmarks of breast cancer include altered expression of ECM-degrading proteinases and their inhibitors  as well as loss or aberrant expression of ECM receptors [108, 109]. How different components of the cell–ECM signaling pathways contribute to the disease state is far from clear. What we do know is that proliferation, migration, and adhesion – all fundamental processes of morphogenesis – are profoundly affected. The work from the authors' laboratories is supported by the Director, Office of Biological and Environmental Research (contract DE-AC03-76SF00098) of the US Department of Energy to MJB and by an 'Innovator' Award to MJB from the Department of Defense Breast Cancer Research Program (DAMD17-02-1-438) and by NIH grants CA64786 to MJB and CA57621 to ZW and MJB. JEF is supported by a California Breast Cancer Research Fellowship (# 6FB-0131).